Who to vote for? I choose Lekan. If Doug Ford hadn’t screwed everything up, this would be an easy choice. But he did, and now it isn’t. For the first time I can remember, we are spoiled for choice in York South-Weston. We have four strong contenders, and three of them are worthy choices. The recent amalgamation of the ward brought Frank Di Giorgio and Frances Nunziata into close combat. Chiara Padovani and Lekan Olawoye are attacking their left flanks. Me, I’m going to vote for Lekan Olawoye. I won’t pretend I have good reasons for doing so, though. I came to this conclusion slowly—although I was able to eliminate most of the candidates quickly. I started by zapping the outside-chance contenders; I’m sure most of them are fine people, but their relative absence and small chances in this high-stakes race make them non-starters for me. Frank Di Giorgio was next to go. He is too conservative and was too close to Rob Ford. He votes against Toronto’s interests. He attends council meetings infrequently—and opposes bike lanes—and that alone is a deal-breaker for me. That leaves three: Nunziata, Olawoye, and Padovani. I like Frances Nunziata, as a rule. She is an excellent retail politician. If you call her, she calls you back. She fixes problems, and she’s given her riding endless hours of underpaid service. Finally, she is an excellent tactician. But I can’t shake the feeling that Weston has fallen on harder times under her leadership. Certainly, most of these problems are not of her making—she’s subject to decisions made above her pay grade, just like the rest of us. I think, however, that with different leadership, things might have been better. That’s because she is not an excellent strategist. Take payday loan shops, just as an index of what I’m talking about. We have too many, and they have dubious social value. I think the job they do would be better done by our oligopoly of banks, which enjoy one side of a social contract but are allowed to ignore the other: they get a government guarantee but shirk the social responsibility. Banks are allowed to close, leaving low-income and low-mobility clients (often one and the same) in the hands of high-interest lenders. I know Frances can’t do much about closing banks. That’s for our provincial and federal masters to tackle. But she could have made Weston, bit by bit, an environment that banks don’t want to leave, with improved streetscapes, better local businesses, and improved transit. She’s been working on these, lately, but too lately for me. Of course, it’s not about payday loans; it’s about all the things like them—the small, strategic failures that have let Weston down. What happened the long-promised college campus? The Humber River Trail link? St John the Evangelist? Buses on Jane? All are long-term projects; none have happened. Strategy. That leaves Padovani and Olawoye. Lekan and Chiara are too close ideologically to fit a card between. I went so far as to create a spreadsheet, and if I recall correctly, Padovani doesn’t have a parks plan but she does want the city to tackle climate change, while Olawoye has a parks plan but says nothing about climate change. Or vice versa. It really doesn’t matter, because I can’t imagine Lekan (or Chiara) being against the climate or parks. So, with two equally good candidates, I would normally back the one most likely to win. It seemed, for a moment, that Chiara was in that position. Then it emerged that Lekan had been left off the poll. And Lekan had a handy lead last time… and the polls have been showing wild swings anyway, which is understandable given how small the sample is. Finally, neither Olawoye nor Padovani is likely to defeat Nunziata. So who knows? That leaves, as far as I can tell, character. Argh. What, really, do I know about character? Nothing. My interactions with Lekan and Chiara have been vanishingly brief, and both left me with the impression that they were excellent, principled, hard-working and ambitious people. We are lucky to have them volunteering for such a lousy job. So I’m left peering at the sediments, trying to divine some worthy grounds on which to make a decision. Here’s what it comes down to: I like Lekan a little more. He seems more grounded, more open, and less partisan. He seems a little less certain, and I like that. He’s been in the community, working hard, for longer, and he’s had tough positions at MaRS downtown. I like that too. With so little to distinguish excellent candidates, that’s all I have to work with. We can blame Doug Ford for that—it was not supposed to be like this. Author Adam NormanPosted on October 21, 2018 October 21, 2018 Categories Cycling, Environment, Frances Nunziata, Muncipal Election, Opinion, Payday Loan Companies, PoliticsTags Chiara Padovani, Frances Nunziata, Frank Di Giorgio, Lekan Olayowe8 Comments on Who to vote for? I choose Lekan. Padovani: TD to keep ATM in Weston for now. The TD Canada Trust branch at 1979 Weston Road. Note the Rockport rental apartment building in the background that will be home to hundreds of new residents when it opens in the coming months. Toronto Council candidate Chiara Padovani has managed to wrestle a concession from TD Canada Trust, set to close its 1979 Weston Road branch on September 21. The building’s ATM will remain open for ‘the time being’ after the branch closes. The bank’s WiFi hotspot (who knew?) will not continue past the closing date. These are the people who sit on their hands while predatory payday loan companies fill the void left by departing bank branches. Apparently they’ve educated the public about those things so it’s ok. In their reply to Ms Padovani’s letter, FCAC alleges that TD provided adequate consultation with the community before announcing the closure. As a result, FCAC won’t compel TD to hold a community meeting. If a letter announcing the closure counts as adequate consultation, then yes, the community was consulted adequately. Undaunted, Ms Padovani also tackled TD who have relented somewhat by agreeing to keep the ATM open past the closing date. In the meantime, she is working with TD Canada Trust to set up a permanent ATM in the vicinity. So far I have received confirmation that the ATM will remain at the current location while they search for a permanent home in the vicinity. While TD is hosting sessions on digital banking and financial literacy in the community, they have not committed to installing a WiFi hub to facilitate the use of such services for people who don’t have access to the Internet. I’m committed to continue to advocate for accommodations for the members of the community who will be negatively impacted by the bank’s imminent closure. Read more from the candidate here. Read Adam’s excellent take on the issues here. Banking in Canada is regulated federally. Incidentally; crickets from MP Ahmed Hussen’s office on the branch’s closing. Author Roy MurrayPosted on August 27, 2018 August 26, 2018 Categories 22 John, Ahmed Hussen, Business, Opinion, Payday Loan Companies, PoliticsTags 1979 Weston Road, Ahmed Hussen, Chiara Padovani, TD Canada Trust3 Comments on Padovani: TD to keep ATM in Weston for now. Padovani tackles TD Canada Trust closing. TD Canada Trust in Weston. Chiara Padovani wants to be York South-Weston’s next councillor for Ward 11, replacing long-time incumbent Frances Nunziata. She has become quite active in the ward and among other things is closely monitoring the state of retail in YSW. She recently promised that she would contact the Financial Consumer Agency regarding the recently announced closure of Weston’s TD Canada Trust branch. The closure was announced without any community consultation and Ms Padovani is seeking such a consultation by writing to the FCAC’s Commissioner, Lucie Tedesco. I am writing to request a meeting regarding the closure of the TD Canada Trust Bank located at 1979 Weston Road in Toronto Ontario (Branch Number 335). This marks the fourth TD Branch closure in York South-Weston, a community that has become the target of predatory lending and payday loans. The bank has failed to fulfill its obligation to consult with the community, and many customers – myself included – did not even receive notice of the bank’s closure. Proximity – The branch is within walking distance of over 10,000 residents. Many of these residents do not own cars and spending nearly $7 on the TTC fare required to get to the new location will be a significant barrier for low-income customers. In Forest Hill, a far less densely populated neighbourhood, there are seven TD Banks within close proximity of each other. Accessibility – The branch is located in a neighbourhood where many residents are seniors and people with disabilities. These residents rely on this branch because they can access banking services without having to travel far. Lack of financial alternatives – CIBC, Scotiabank and TD Canada Trust branches have already closed down and left the neighbourhood. Predatory lenders are quickly filling the gap for financial services in York South-Weston. As you know, these institutions trap hard-working families in a cycle of debt and economic violence that will threaten the quality of life for too many in this community. These are just some of the reasons I ask that the Financial Consumer Agency of Canada convene a public meeting between the community and TD Canada Trust to discuss and resolve the challenges posed by the bank’s imminent closure. I contacted the MP for York South-Weston Ahmed Hussen a couple of weeks ago regarding the closure and a staff member tried to fob me off to the Ottawa office bizarrely claiming that it was not a local matter. After persisting, the staffer said he would inform the minister and call back but never did. Apparently that’s not an unusual experience. If you would like to add your voice to the initiative, contact the FCAC at 1-866-461-3222 and mention file number 363484. Author Roy MurrayPosted on May 29, 2018 Categories Ahmed Hussen, Business, Frances Nunziata, Muncipal Election, News, Payday Loan CompaniesTags Chiara Padovani, TD Canada Trust, ward 11, York South–Weston5 Comments on Padovani tackles TD Canada Trust closing. Rick Mercer has tackled one of our favourite topics here at Weston Web; payday loan companies. I was recently amazed when I visited a bank teller to take out cash. There were—forgive me here—little old ladies with passbooks in clear vinyl envelopes asking the tellers in salty, sunny, Mediterranean languages about their balances. I hadn’t seen a passbook in three decades, and I was amazed that people still use them. I was amazed the bank still prints them. And, if I’m honest, I was also infuriated: my god, the line was slow. Do you people not know about apps? But my fury at the waiting in line will be nothing compared to my anger at not having a lineup at all. The TD Bank at 1979 Weston Road will close and move to the Crossroads Plaza by this time next year, according to residents. (TD has not yet returned my calls.) This is the latest in a series of closures that are turning downtown Weston into a banking desert: the RBC and TD banks on Jane have closed, as did the Scotiabank at Weston and Lawrence. In two years, we will have gone from six branches (and four banks) to two. Only RBC on and BMO, both on Weston Road, remain. While the big banks have been moving on, money-lenders and high-fee cheque-cashing businesses have been moving in. There are at least 10 payday loan or cheque-cashing places in Weston. Something is wrong with a community when there are more usurers than ice-cream shops. I’m not usually the sort of guy who says that the government should meddle in business, but in this case, I think they should. Banks are not meeting their social obligations, and the government has a strong moral reason to regulate minimum levels of service—and the muscle to do so. Being banked is a critical part of being a citizen; even the government pays by cheque and prefers direct deposit. (You can’t collect Ontario Works, for instance, in cash.) Allowing banks to close forces people into the hands of cheque-cashers, who charge about $3, +3% of the value of the cheque: a whopping $33 on a $1000 payday. Worse, the people who will pay are those least able to: the poor, less-literate, and less mobile. Being gouged by MoneyMart makes a lot more sense when you’re faced with a 90-minute walk or a $6.50 fare and a snowy hour waiting for buses. And then there are the knock-on, long-term effects. To open an RESP, get financial advice, or save in a TFSA, you need to have a branch. None of it can be done online. Pulling out banks means pushing people to the financial margins, and that will make our community poorer in the long run. You need to be close to a banker to pull ahead. Of course some of us—those with cars, $100 cellphone plans, and the wherewithal to direct-deposit our infrequent cheques by photograph—we will all be fine. After all, I didn’t know people still use passbooks because I hadn’t stood in line for years. But you can’t both curse a bank’s Friday lineup and say we don’t need it. According to the CIBC website, the CIBC Banking Centre at 1174 Weston Road will close on Friday, October 20, 2017 at 1:00pm and merge with the Keele and Saint Clair Banking Centre 3 km away. Despite big banks’ record profits, there is an ongoing trend to close and consolidate branches. Weston’s Scotiabank branch closed last year. Who will be affected most by this? People in the neighbourhood who walk to the branch or even worse, those who are uncomfortable with or cannot afford computers; namely the poor and the elderly. 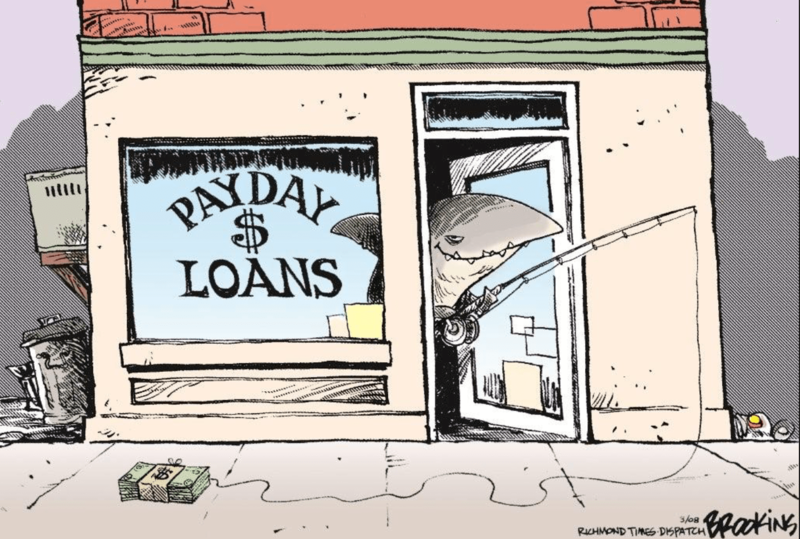 One wonders, if payday loan companies can afford to have branches on every corner, why can’t the big banks? CIBC would like you to move your banking to here. Banks know that customers are loath to change from one bank to another and feel that cutting service (and jobs) is better for business than serving people where they live. After dragging its heels for months, the Ontario Government has finally acted on a promise to do something about the huge rates charged by the payday loan industry in this province. As readers in Weston / Mount Dennis are painfully aware, these stores have proliferated in our communities and prey mainly on the poor, charging as much as 21% for a two-week loan; an eye-watering annual rate of 14,299%. All of this was made possible in 2006 by the lovely Vic Toews, then Minister of Justice and Attorney General of the late lamented Conservative government. His bill made it legal for companies to charge more than (the then) usurious rate of 60% annually by giving provinces the power to regulate their own loan rates. Ontario opened the flood gates in 2008 and the payday loan industry hasn’t looked back. The provincial Liberal government, instead of taking leadership, has listened to the Payday Loan lobby and rather than lowering rates drastically, they have decided to take the line of least resistance. They are quietly proposing that as of January 2017, rates for a two-week loan drop to 18% and then in January 2018, rates will become 15%, matching those of Alberta. While this is a good start, there is nothing in the legislation that addresses the dire plight of people forced to borrow at such appalling rates. 15% may sound better, but it is still 3,724% compounded annually. Here is John Oliver’s take on Payday Loans. Does Ontario have to go this route? Quite simply, no. Quebec has taken the lead and they cap annual loan rates at 35%. As a result, there are no payday loan companies in that province. That is the example that Ontario needs to follow and would help poor in our province dig their way out of poverty. In addition, some pressure on our hugely profitable banks and credit unions to provide loans to the poor would not go amiss. If readers would like to comment on the proposed changes to the act, the Ontario Government isn’t making things easy. The contact page is here and a written submission may be sent via email or snail mail. MPP Laura Albanese’s contact information is here and her constituency phone number is 416-243-7984.